Chargers. If you’re like me, you probably have a few e-cigarette chargers lying around your desk. The iGo 4 still has a charger of course, but its unique wireless charging base makes charging your e-cigarette much more simple. 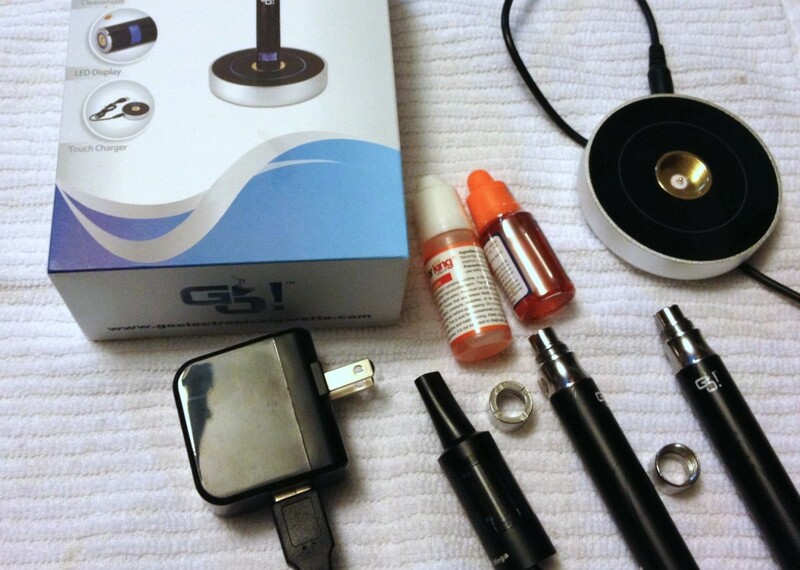 Of course easy charging doesn’t mean much unless it’s a good e-cigarette kit, so here’s the iGo 4 review to find out how it works. I’m just going to skip to the main attraction here, the iGo’s charging base. I know what you’re thinking, because I thought it too. Is it really that much work to just screw an eGo into a charger? Of course it’s not, but I found myself doing a better job of charging this thing than I do with a typical e-cigarette of the same style. It is pretty easy to just set it down in the base and move on. Here’s how it works. 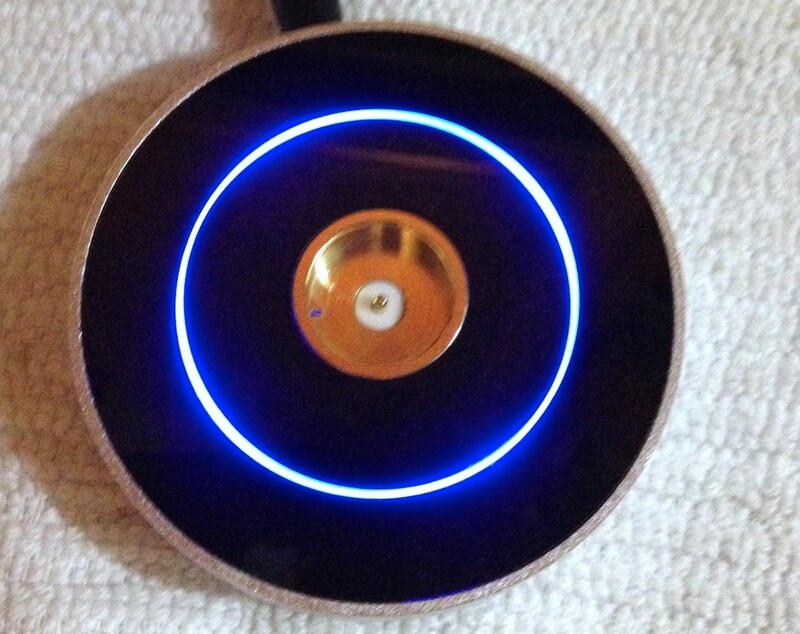 The charger is a metal disk with a shiny black top. There is a recess in the middle of the disc where the iGo 4 sits. Also on the top is a really cool LED stripe going around the top that illuminates red when it is charging and blue when it’s charged. If Tron vaped, this is what he’d use. Inside the hole for the e-cigarette is a post. 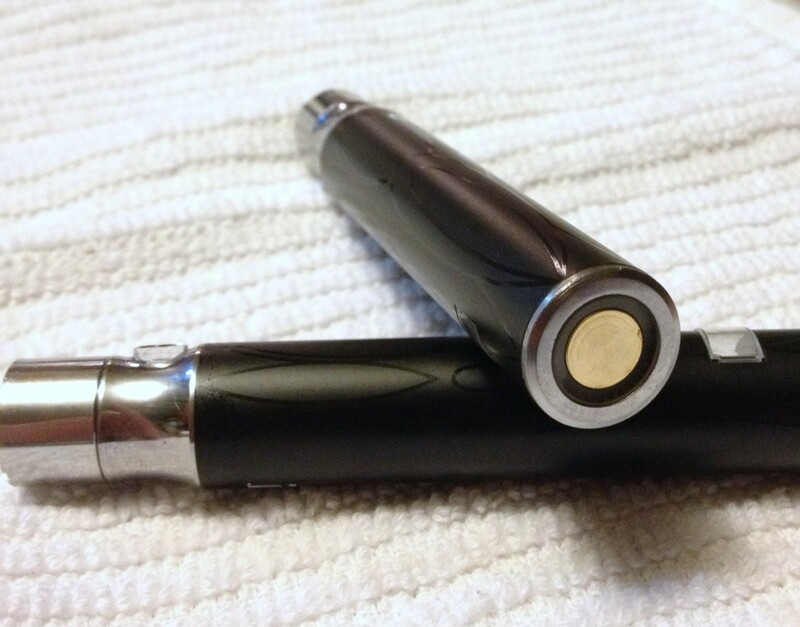 The end of the iGo ecig has a metal contact instead of the traditional end cap or USB port. That contact connects with the pin inside the hole while the edge makes the negative contact with the edge of the recess. The whole thing just stands on the disk. You just have to put it in place and the iGo stands up and charges. The charger itself has a USB cable, but alas it’s not a standard cable like mini or micro, which would have been a very handy feature. Moving along to the rest of the kit, the batteries are similar to an eGo battery, but not quite the same. For starters, there’s a small LCD screen on the bottom of the battery. The screen displays a battery graph to show the current charge status and a puff counter to show… numbers. To this day I have no idea why the factories think anyone really wants a puff counter, but they keep putting them on things. The battery meter is of course a nice thing to have so you know where you stand on battery life. The battery is 750 mAh, pretty standard for eGo styles. The top of the battery has eGo cone threading on the battery connector, but the power button assembly looks different from stock eGos. The activation button is backlit blue and has a gemstone shape to it. The batteries also lack that nifty rubberized matte coating as well. There however is a subtle black on black design on the batteries which gives it a nicely finished look. 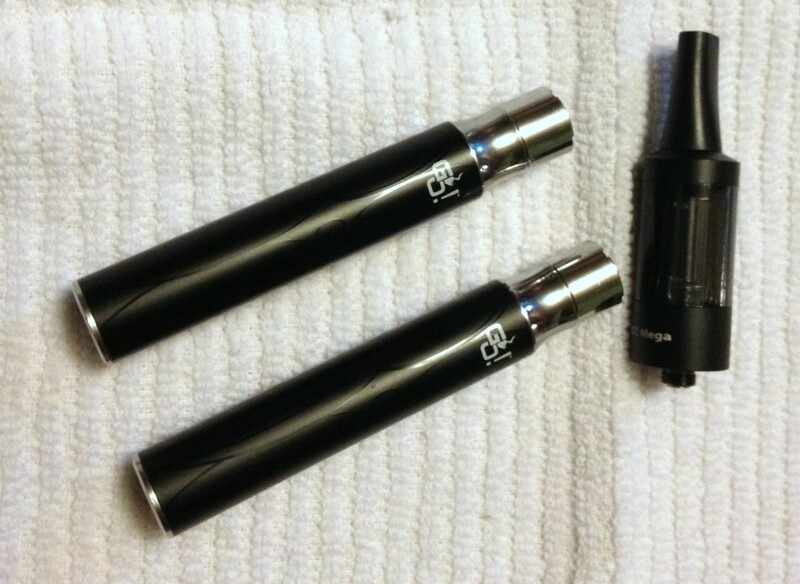 Gocig also tossed in a pair of dress up cones for the batteries that match up nicely with the clearomizers that normally come with the kits. However, I can’t really talk about that because my kit came with a pair of iSmoka BCC tanks and a note saying they are trying out a new tank. I’m not complaining because I like the iSmokas (see my review here), but they do look a little funny because the dress up cone was designed for a thinner clearomizer. When you order yours, you might want to drop the company a line and see which one your kit will come with. The other ones might be great too, I just have never tried them. The charging part of this section is obviously fairly simple. Put it on the disk, watch the pretty lights change colors. There is more to it than that of course. I did notice this probably isn’t the fastest e-cigarette charger on the planet. Charging seems to be quite a bit slower than other eGo devices. The kit comes with an AC adapter, you’ll want to use that instead of plugging it into a computer USB port. Charging via a computer port is indescribably slow. Charging via AC is better, but still not what I’d consider quick. As far as performance goes, I was genuinely surprised by how well this setup performed. I couldn’t get a voltage reading with my volt meter at all, so there’s some sort of odd power regulation going on. I’m going to guess it’s around 3.7 volts. The odd thing is that when strapped to the included iSmoka vapor production is way better than you’d think. The iGo 4 just puts out great vapor. It runs an iSmoka better than some of my regular devices. I can’t quite explain it to be hones. I also strapped a CE5 on to the iGo and got equally good results. It seems to perform better than most of the other fixed voltage eGos I’ve tried before. Battery life is fairly decent as well thanks to the extra 100 mAh the battery carries over regular eGos of similar size. 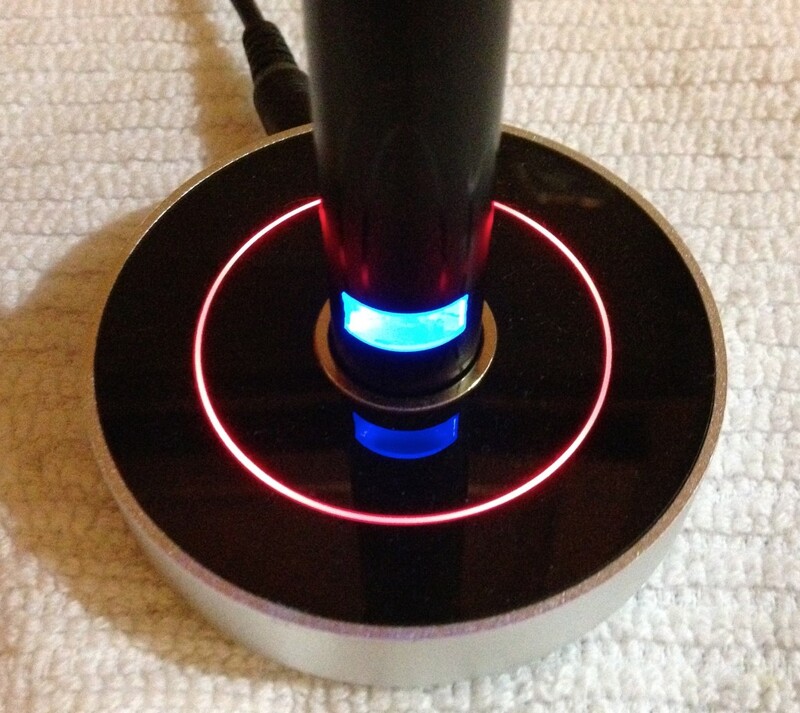 Most users will get several good hours out of the iGo 4 before having to put it on the space-age charging disk. The charging disk may be a bit of a novelty, but it’s amazing how handy it is. Even if the idea of a charging base isn’t a big deal, this is still one of the better performing eGo kits out there. The iGo 4 charges via a base station without having to screw the battery into a charger. Just drop it in the base and it starts charging. Normally this would just be a novelty, but thanks to a surprisingly good performance profile, this is a compelling eGo style e-cigarette. You can get one of these from Go Electronic Cigarette. Disclosure: I received this item for review from Go Electronic Cigarettes. This review features affiliate links.